The beautiful Miss Philippines-Earth 2014 candidates took over SM Megamall Supermarket and its Event Center to show everyone what "beauty for a cause" is all about. All participants are physically beautiful and environmentally knowledgeable, setting a legacy of beauty and responsibility. 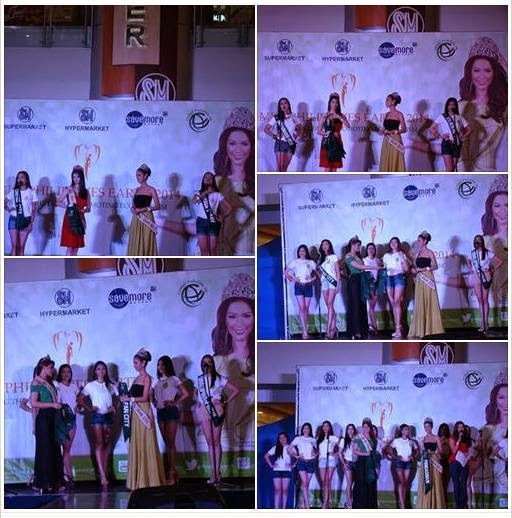 The candidates place a strong emphasis on environmental protection programs,and SM Supermarket, SM Hypermarket and Savemore Market serve as platforms for Miss Philippines-Earth 2014 in spreading awareness on environmental issues. Beauties for a cause join the M.O.B. This collaboration is a healthy boost to Sm's pioneer campaign for reusable bags, Join the M.O.B. (MyOwnBag), which encourages shoppers to ditch plastics in favor of reusable shopping bags. The delegates serve as ambassadresses of the SM Greenbag, by encouraging more and more shoppers to choose to reuse. Hand-in-hand, the partnership between the SM Food Retail Group and Miss Earth is expected to continue to bring Filipinos closer to a cleaner and greener tomorrow. The delegates will take on SM's Cooking Challenges at SM Faireview's Supermarket and Hypermarket on April 11. The girls are scheduled to do good deeds on Easter Sunday. Moreover, they will be joining in the 5-day Sale at SM Hypermarket-San Lazaro and SM Hypermarket-Bicutan on May 2 as part of green initiatives promotions. Their environmental protection campaigns culminates with the grand coronation night on May 11, 2014 at the Mall of Asia. Arena.